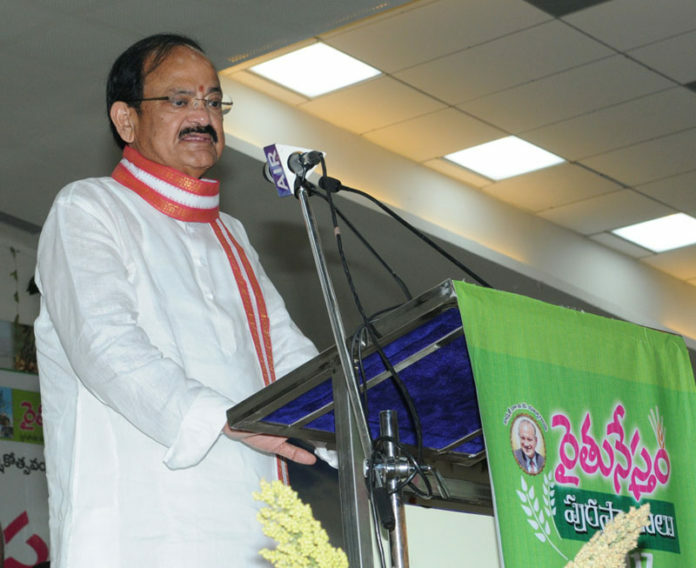 The Vice President, Shri M. Venkaiah Naidu addressing the gathering at an event to present 13th Dr. I.V. Subbarao Rythu Nestham Awards 2017 to farmers, constituted by Sri Muppavarapu Foundation, in Atkur, Andhra Pradesh on October 03, 2017. Sriharikota: The Vice President of India, Shri M. Venkaiah Naidu has said that the remarkable team work and output shown by Indian Space Research Organization (ISRO) over the years is a model for other departments and institutions. He was addressing the gathering after inaugurating the week long celebrations of World Space Week, in SHAR, Sriharikota, Andhra Pradesh today. The Governor of Andhra Pradesh, Shri E.S.L. Narasimhan, the Chairman, ISRO, Shri Kiran Kumar and other dignitaries were present on the occasion. The Vice President said that his heart swells with pride with India’s prowess in space technology as country marches ahead to conquer new frontiers in space exploration. It is a double delight to him to be here as this internationally-renowned rocket launching site is located in his native district of Nellore, he added. The Vice President said that a thousand years ahead of Europeans, Indian savants knew that the zero and infinity were mutually inverse notions. He further said that with the launch of the first sounding rocket from Thumba Equatorial Rocket Launch Station (TERLS) in 1963 and the first Satellite, Aryabhata in 1975, India has made giant strides and has emerged today as one of the leading space faring nations in the leadership of visionaries like Prof. Vikram Sarabhai, Prof. Satish Dhawan and former President, Dr. A.P.J. Abdul Kalam. The Vice President said that by putting 104 satellites into orbit in one go and placing the heaviest Indian satellite, GSAT-19 weighing 3,136 kg in its orbit earlier this year, India’s space scientists and technologists have not only done the country proud but made the world to sit up and take note of its accomplishments. It is not a question of mere technological advancement, but achieving launch after launch successfully at much lesser costs of similar missions in advanced countries which makes every Indian proud, he added. The Vice President said that this space port on the spindle-shaped island is one of the busiest satellite launch centres in the world and catering to global needs by truly epitomising India’s philosophy of ‘Vasudhaiva Kutumbakam’. He further said that all the activities of ISRO have been centred on societal applications. 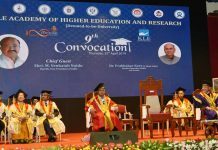 ISRO now stands as one of the most reputed and leading space agencies in the world and is a huge source of inspiration to students and young and upcoming scientists, he added. The Vice President made a visit to the Vehicle Assembling Unit at the SHAR. “ISRO Chairman, Shri Kiran Kumar, distinguished scientists, brothers and sisters! As I step into this busy space port at Sriharikota, my heart swells with pride. It symbolises India’s prowess in space technology as the country marches ahead to conquer new frontiers in space exploration. It is a living monument to the efforts of scores of visionaries, thousands of engineers and scientists who made this possible; who dared to dream and shape that dream into reality. In fact, it is a double delight to me to be here because this internationally-renowned rocket launching site is located in my native district of Nellore. As I was coming here, I was just thinking how cosmology, creation of universe, sun, moon, stars, galaxies and planets have fascinated man from times immemorial. Indeed the concept of time and space, cosmology, creation of universe is not new to Indians. The celebrated astrophysicist Carl Sagan pointed out that Hinduism is the only religion in which the time scales correspond, no doubt by accident, to those of modern scientific cosmology.” Its cycles run from our ordinary day and night to a day and night of Brahma, 8.64 billion years long. Longer than the age of the Earth or the Sun and about half the time since the Big Bang,” said Sagan. Many other scholars and savants from India and other countries studied the role of science in ancient India. French historian of mathematics, Georges Ifrah, who is the author of the book, ‘Universal History of Numbers’ said: “ The Indian mind has always had for calculations and the handling of numbers an extraordinary inclination, ease and power, such as no other civilisation in history ever possessed to the same degree. So much so that Indian culture regarded the science of numbers as the noblest of its arts. A thousand years ahead of Europeans, Indian savants knew that the zero and infinity were mutually inverse notions”. Since the baby steps with the launch of the first sounding rocket from Thumba Equatorial Rocket Launch Station (TERLS) in 1963 and the first Satellite, Aryabhata in 1975, India has made giant strides and has emerged today as one of the leading space faring nations, thanks to visionaries like Prof. Vikram Sarabhai, Prof. Satish Dhawan and former President, Dr. A.P.J. Abdul Kalam. By putting 104 satellites into orbit in one go and placing the heaviest Indian satellite, GSAT-19 weighing 3,136 kg in its orbit earlier this year, India’s space scientists and technologists have not only done the country proud but made the world to sit up and take note of its accomplishments. It is not a question of mere technological advancement, but achieving launch after launch successfully at much lesser costs of similar missions in advanced countries which makes every Indian proud. As many as 209 foreign satellites from 28 countries were launched in missions undertaken by ISRO. ISRO scientists have also achieved what others could not do—putting spacecraft in orbit around Mars in the very first attempt—a remarkable feat indeed! While mentioning about low cost, the one thing that comes to my mind, not only mine but of every Indian, is the prestigious Mars Orbiter Mission which has taken India to the red planet at a much lower cost compared to other space agencies and that too in the maiden attempt, which is indeed a unique achievement. I appreciate the dedicated efforts put in by all of you in achieving the historic milestone. I am extremely happy that today you are having the men behind that mission, Shri A.S. Kiran Kumar, your Chairman and Shri P. Kunhikrishnan, your Director to lead you to greater heights and bring more and more laurels to the nation. Only some days ago, Mars Orbiter Mission (MOM) completed three years. Another proud achievement was the discovery of water on moon by Chandrayaan-1. Today, this space port on the spindle-shaped island is one of the busiest satellite launch centres in the world and catering to global needs by truly epitomising India’s philosophy of ‘Vasudhaiva Kutumbakam’. All the activities of ISRO have been centred around societal applications. 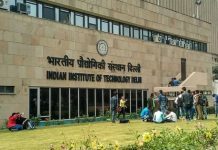 ISRO now stands as one of the most reputed and leading space agencies in the world and is a huge source of inspiration to students and young and upcoming scientists. From communication to weather forecasting to telemedicine and disaster warning, ISRO’s efforts have enabled our nation to achieve self-reliance in most of our communication and earth observation requirements and helped in enhancing the living standards of the people. I am aware that weather predictions by ISRO Satellites when cyclones like Phylon and Hudhud hit Odisha coast led to saving of many lives. ISRO’s contributions were also recorded with gratitude during the recent Vardhah cyclone for timely and accurate prediction. India was lucky that the country’s space programme took wings under the visionary leadership of Dr. Vikram Sarabhai. In his autobiography, ‘Wings of Fire’, former President, A.P.J. Abdul Kalam said: “I consider Prof. Sarabhai as the Mahatma Gandhi of Indian Science — generating leadership qualities in his team and inspiring them through both ideas and example”. I am glad his great vision is still being carried forward by all of you with India being second to none in using advanced technology for exploring new frontiers and to ultimately benefit the common man, which should be the basic objective of any science-related activity. Some of you here must have also had the privilege of working with Dr. Kalam, who had worked with single-minded devotion for the success of India’s first Satellite Launch Vehicle, SLV-3 and also with Prof. Satish Dhawan, among others— all of whom had contributed immensely with their management and leadership styles towards the rapid strides India achieved in the space sector. Extending support to South Asian countries with the launch of a dedicated satellite, GSAT-9 by GSLV-F09, is another commendable achievement of ISRO. I am happy that ISRO had a very successful mission of heavy lift launcher GSLV Mk3 in the first attempt itself. We are also in the elite club of nations having cryogenic and re-entry technologies. The remarkable team work and output shown by this organization over the years is a model for other departments and institutions. After showing to the world how excellence could be achieved at minimal costs, I am told that you are immediately planning your second mission to moon, including a lander and a rover for scientific experiments. I also learnt that you have plans to reach the sun, like Adithya mission, and you are also developing technologies for Human Space programme. Before coming to this function, I visited the huge facilities being built at SHAR to meet the challenging demands of the future.. There, I could understand the dedicated and untiring efforts that went into the launch of three different launch vehicles in the shortest time span of two months. I wholeheartedly appreciate each one of you for that. At this juncture, I recollect my earlier visit to this place with Honourable Prime Minister, when Shri Kunhikrishnan explained the details of French satellite, SPOT-7 mission by our PSLV-C23 as the Project Director. Now, when he is the Director, I could see that SHAR is undergoing a massive infrastructure development, under the guidance of Chairman, ISRO, to meet the future requirements. I am informed that once the second vehicle assembly building, which is three times bigger than the present one, is commissioned and augmentation of other facilities is completed, the number of launches per year can be more than doubled, leading to self-reliance in space launch. I once again laud all of you for your skills, knowledge, dedication and sincerity over the years for the various milestones achieved by ISRO. I am told that various outreach programmes like quizzes and essay competitions, exhibition and arranging visits to school students are being organized during the World Space Week. Such programmes will increase the awareness on space-related activities among the youngsters and inspire them. I also appreciate the steps you are taking to reach out to every nook and corner of this state and the neighbouring states to encourage and attract young minds. Today, I am happy to be with you in Sriharikota for the inaugural function of this week long celebration of World Space Week. I am also happy to have the presence of Shri Kiran Kumar, Chairman, ISRO who is leading this great organisation to laudable heights. My best wishes for the success of all your future endeavours.